When HTC announced its stand-alone Re sports camera, more than one commenter wondered what the company was doing leaving its smartphone comfort zone for an industry that's already dominated by a single player. Though the Re camera is decent enough on its own and the design is completely unique, it's not enough to sway potential buyers away from GoPro and Sony cameras, which have more features and an established reputation. Apparently someone at HTC agrees, because the camera is being discounted by a whopping 75%. That brings the price down to just $50, well into impulse buy territory and much more palatable than the original $200 retail price. 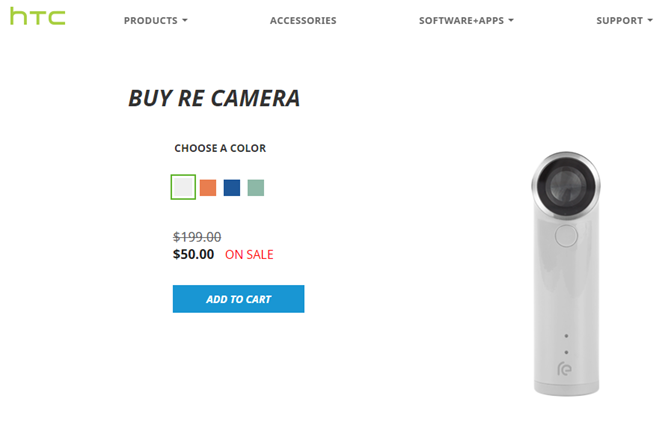 HTC's US online store is selling them in white, orange, blue, and teal color options. Standard shipping is free. We don't know if HTC is selling the Re at the discounted price in other countries, or whether it will be available at the cheaper price at those few retailers that actually carry the camera - Amazon currently has it for around $100, and Best Buy will send you one for $150. The water-resistant Re uses a 16MP sensor with a wide-angle lens, a unique periscope shape for fitting into special accessories, and a MicroSD card slot for recording photos and videos. It connects to iOS or Android apps (including non-HTC devices) for transfers and viewfinder functionality. The low price might make you nervous about a new model... but since we haven't heard anything about an update, it seems like the line will probably end right here.